Every other Thursday during winter, my church has "Sewing". It's a day where we're all welcome to come together and do a variety of sewing related activities, all for charity. I normally enjoy going, but this last Thursday, my four-year-old had the sniffles, so I stayed at home and declared it the day to finish up this quilt for do. Good Stitches. For those of you unfamiliar with this name, it's an online quilting bee group that makes quilts for charity. You can find out more about it here. So for my month (which was way back in September, oops!) I asked the members of my quilting circle to make green blocks with any design they wished. The only requirements were the size (12.5" square) and that they include one 'jewel' scrap of another color in each block. I received back some wonderful blocks, and although I've had them all sewed together in a top since before Christmas, now was the time to finish this thing up! As you can see, I decided to tie this one. I've been falling in love with this method, due to the lovely quilts over at PosieGetsCozy. And I can say that I LOVE it and will be doing it again! I used a crochet cotton, so the ties are not that bulky. It's really fast, and makes for a veeeerrryyyy soft and squishy blanket. I pieced together a bunch of blue fabrics for the backing, and used orange for the binding. Does this photo convey the softness of this quilt/blanket? 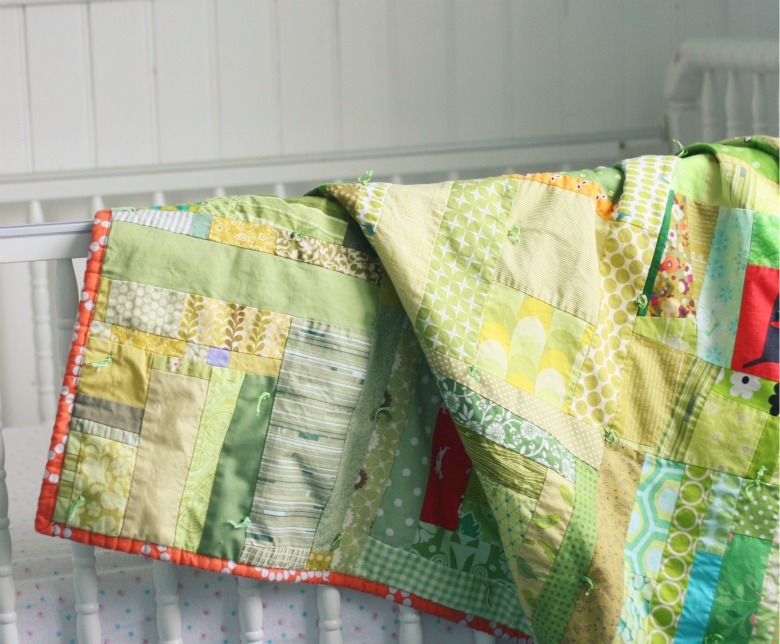 It's tempting to keep it for my children, but they obviously aren't in need of more quilts! It will be going to My Very Own Blanket, an organization that gives quilts to kids in foster care. That looks so cozy! And really fun, too! That sounds like a great idea for a bee quilt, too. May have to borrow this one when it's my month in our Imagine circle. Thanks! Beautiful quilt. It does look soft and cuddly. And for such a good cause. It is going to make some little person feel so special. Oh, it turned out lovely! 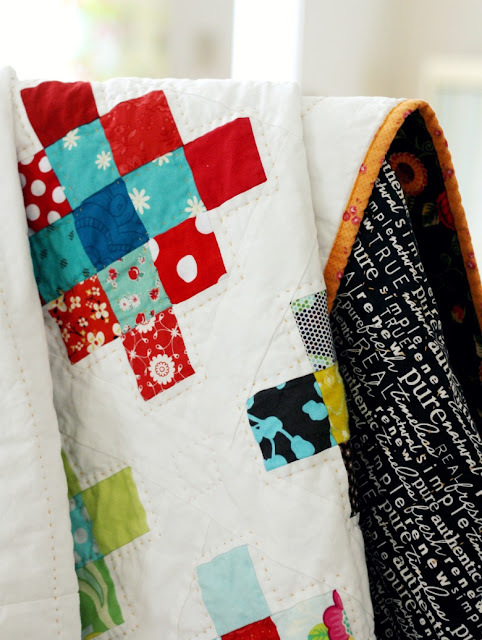 I hand tied my last quilt and am in love with this method, too! So nice and cozy! It does look lovely and soft! I love the ties. And all the greens look so good together. It looks lovely and so very cozy! 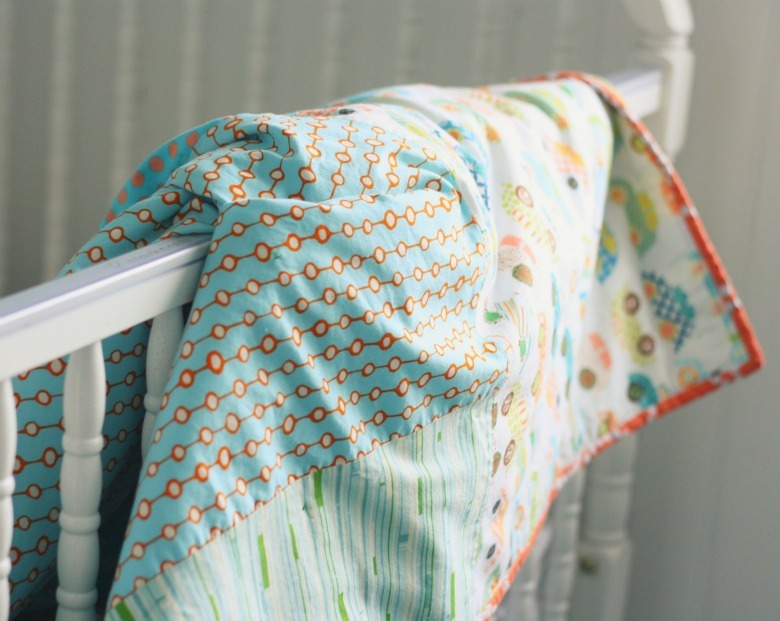 I became a fan of tying them off like this too after seeing one of Alicia's gorgeous quilts! I'll have to try it -- it looks so perfect with this style of blocks! It does look lovely and soft and what a great place to send it! 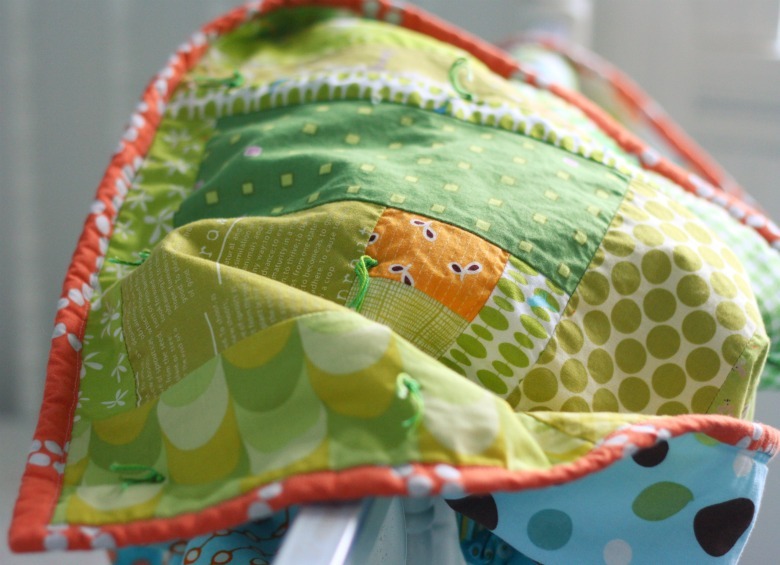 It is a very lovely quilt, it would be very tempting to keep... Thank you for sharing about the tieing. It looks very soft, and will hopefully make someone very happy! It's so great that you took made your own charity sewing time at home since you weren't able to go to church. The quilt does look snuggly and bright. Thanks for the link to MVOB. I love it, it does look so soft and cuddly! I haven't tied a quilt before, but this makes me want to try! I love your quilt and your idea of tying! I used to do that years ago, I'd forgotten how nice it can look. I am in that Bee as well (cherish circle) and really enjoying it. It is my month in March so I better get planning! I love the idea of asking for just one jewel in each green block. What a lovely quilt! Ok, now I want to tie something. Quick! I've never tied a batted quilt so I don't know what I'm missing. Does make for a fast finish too. I have really messed up, started writing a comment and it took off, I'm sure it will seem so strange and out of place when found. I really have found such a treasure when I came across your site and want to thank you for all you share and give. That is such a lovely quilt. It looks so soft and lovely. Someone is really going to enjoy it. Gorgeous! I love the idea of hand tying! Love all the fabric went together.. I think whoever received this quilt will treasured! what type of batting do you use? 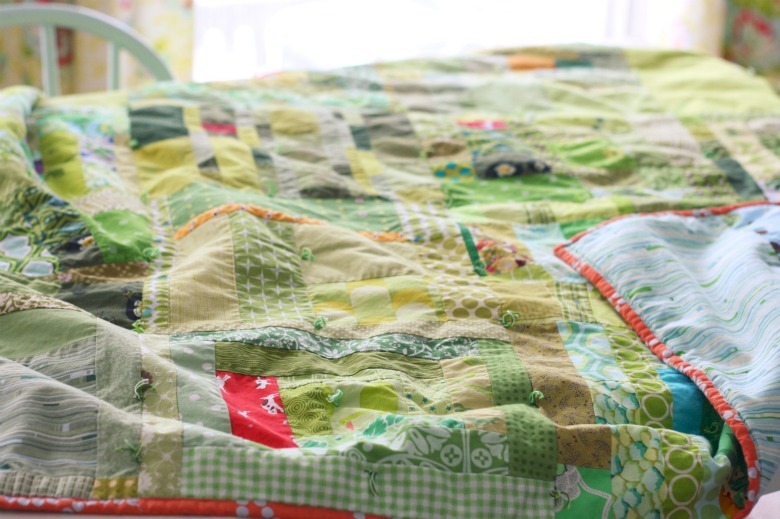 this is one of the coziest-looking quilts ever! I normally use 100% cotton batting, either Hobbs for Warm n Natural. For this one though, I was using up a big piece that had been sitting around for a while. It's a really low loft poly, although I don't know the brand or any more details. There are times when a poly batting is just right, especially for a tied quilt. It's just a bit puffier and really soft! i love this so much! i also wonder what kind of batting you are using? Looks gorgeous - brilliant idea to add those flashes of colour! How do you decide where the ties go - is it a regular grid pattern or random?